The admiring glances originally emanated from times at Chesterfield, the ability clocked and safely logged. Now Marc McNulty is finally at the disposal of long-time suitor Paul Cook. And according to Leam Richardson, the hat-trick hero isn’t yet at full speed as he revels in Fratton Park game time. 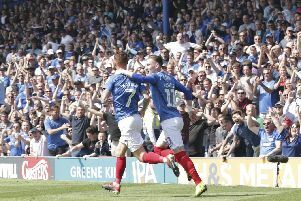 The 23-year-old took his Pompey tally to four goals in as many appearances, following a starring role in the hammering of York on Tuesday night. Only 72 hours earlier he had opened his Blues account in the 2-2 draw at Carlisle, having entered from the bench in a cameo curtailed by a head injury. However, he was giving a starting spot operating behind lone striker Caolan Lavery against the struggling Minstermen in midweek. And what followed was a magnificent display from the Sheffield United loanee, who cannot be recalled from his loan before its January 3 expiry date. And Richardson is adamant McNulty has not yet reached the heights his talent is capable of. Pompey’s assistant manager said: ‘Even when we were at Chesterfield we liked him, we have always enquired about him, always kept tabs on him. ‘Marc’s a player the gaffer and myself like a lot and luckily we have managed to get him to play for Portsmouth. ‘The lad wants to play football, he’s eager just to get out there and play, he felt – and Sheffield United felt – it would be good for his progression to come here. ‘With minutes and fitness I think you’ll see a lot more than what he showed against York. ‘He’s not played a lot before he came here and I wouldn’t say is at his sharpest yet, considering the lack of minutes he has had over the last few of months. ‘But in training you can see his quality, and with fitness, game time and timing I think you will see a lot more of him. McNulty had started just one league game for the Blades this season, despite netting 13 times last term. The arrival of Nigel Adkins in the summer and signing of Billy Sharp had seen the Scot drop out of the first-team frame for the Bramall Lane outfit. Now Pompey have provided the stage for him to shine in the pursuit of regular football. And with Cook employing his 4-2-3-1 system against York in the week, McNulty slotted into place. Richardson added: ‘On Tuesday Marc scored three goals, assisted a couple, should have had a penalty, put a couple over the bar, everything you want in a forward-thinking player, he was fantastic. ‘He was playing just slightly off Lavs (Lavery), the gaffer had worked on a few things this week and last week and thankfully it paid off. ‘In our opinion, considering the tools of the lads, we decided to start them in that system. ‘Lavs has his energy and endeavour, how he stretches teams, and Marc is certainly a technically-thinking player, very good in tight spaces.